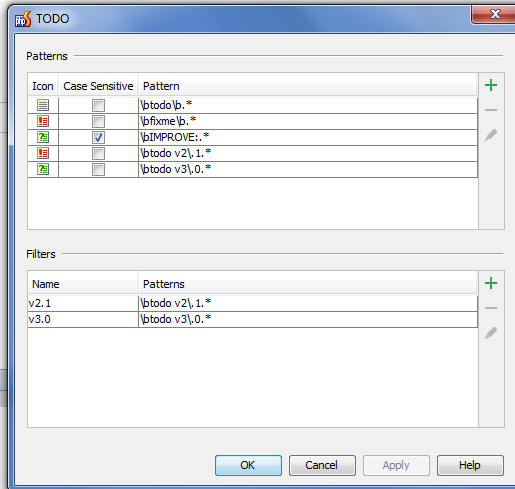 How can we create version specific todo filters? I tried regex "\btodo v2.1\b. 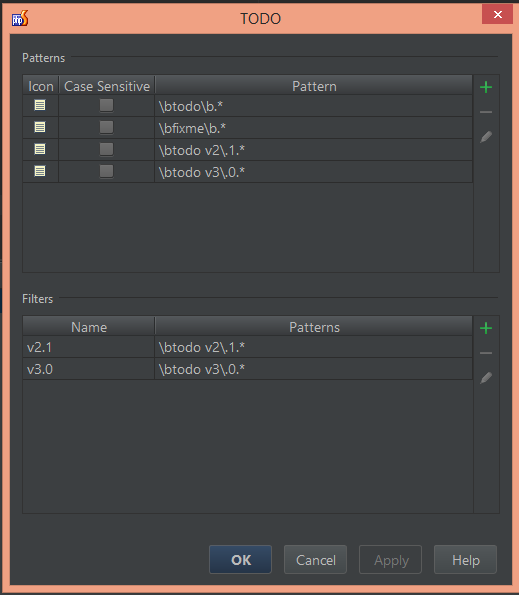 *" and similar variations that work when testing with http://www.regexr.com/, but I get 0 results when using this pattern in PhpStorm. 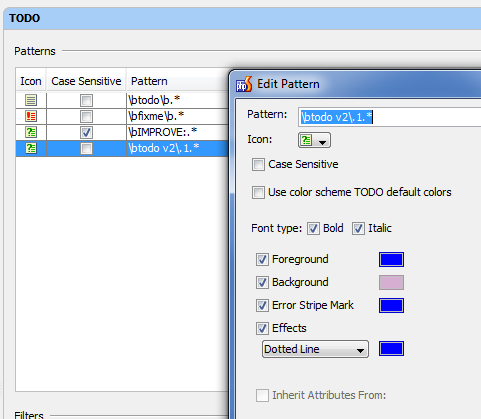 I assume you want to create TODO pattern .. as TODO filter is just a colection of existing patterns. Worsk for me (using the same EAP build 138.379). But it seems to only work in "Current File" tab and not in "Whole Project" or "Scope Based"
I may only suggest to file a Bug Report ticket to the actual Issue Tracker ( http://youtrack.jetbrains.com/issues/WI ) and let devs to look into int. Thanks Andriy, it actually started working for me on that small sample file I created after logging out and logging back into my PC (perhaps delay in indexing? ), but then I tried it on "Scope Based" search and again received 0 results, went back to sample file and it stopped working as well. 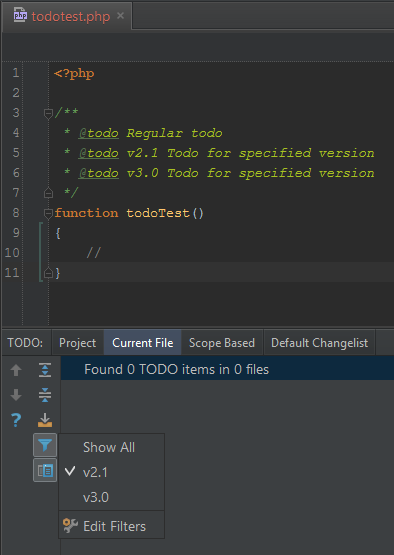 So it looks like "Scope Based" custom TODO pattern issue could be reproducable, I'll submit new ticket. 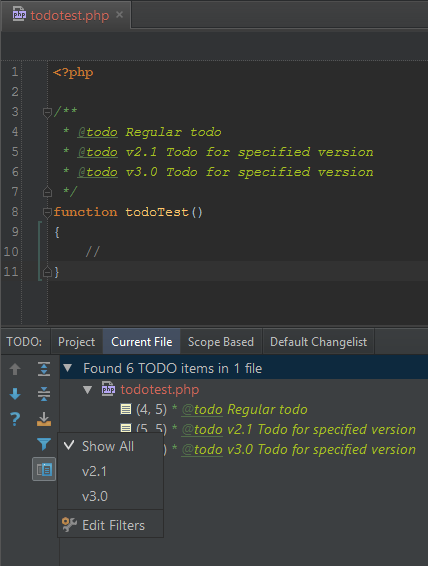 It seems to me that the problem is with TODOs defined via PHPDoc (e.g. 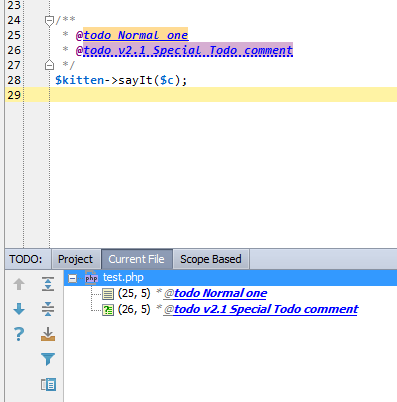 /** @todo v2.1 bla bla */), because if it's defined via "normal" line or block comment (e.g. //TODO v2.1: bla-bla or /* @todo v2.1 bla-bla */) it works OK.